The key part to the talkbox is the compression driver. 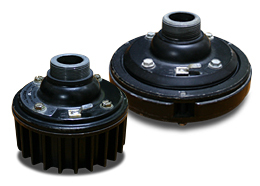 Compression driver is a driver unit for horn speakers commonly found in stage monitors and JBL studio monitors, and are named compression because it transmits pressure to the diaphragm. Just like speakers that drives a cone sheet are called cone speakers, compression drivers with a horn are called horn speakers. A horn is attached to a compression driver in a horn speaker whereas a tube is connected to the compression driver in a talkbox. One of many famous talkboxes are the Golden Throat series from Electro Harmonix, that were favored by Roger Troutman. The Golden Throat series utilized Electro Voice's 1823M compression drivers are often positioned as references between talkboxers. Unfortunately, they are no longer manufactured and auction sites like eBay would be your best choice if you would like to purchase them. Talkboxers around the world are also in search of these drivers so it could be priced fairly high. Lately, companies like Monacor and Pyle have been manufacturing compression drivers, so using these to build your original custom talkbox may be a great choice as well. FYI, compression drivers are easily damaged, so it is highly recommended to prepare a replacement just in case. Roger Troutman always set up 2 systems so that he could continue his performance even if one blew up during his stage.